Wood deck power washed and ready for stain. While refinishing a wood deck does take time, great results come down to four simple steps. 1. You need to assess the condition of your deck. 2. You need to make necessary repairs. 3. You need to prepare the surface. 4. You need to use quality penetrating deck sealer. It’s not an exaggeration to say that preparation is 75% of any finishing job. The final step will go quickly if you’ve invested your time on the first steps dealing with preparation. Every deck refinishing job is different, and it’s important to assess your deck’s unique situation before you start anything. Look at the condition of the surface of the deck. Is your deck’s surface in fairly good condition, or is the wood deeply cracked and splintering? This will make a difference in the total amount of work you must do to restore your deck to good condition. Check the condition of the underside of the deck. Look for infestations such as carpenter ants or termites. Dry rot is also a common problem. Pest must be eliminated and damaged wood replaced. An attractive appearance up top means nothing if the understructure is decaying. Note any other physical repairs that you need to make. Loose screws or nails are a common problem. 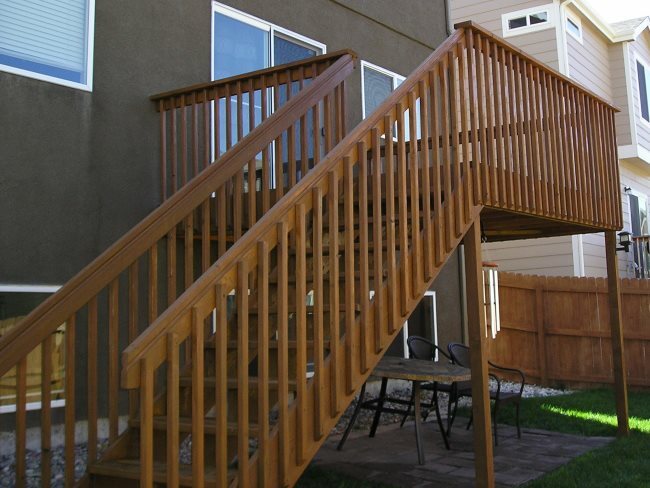 Now is the time to make sure your deck is structurally sound. 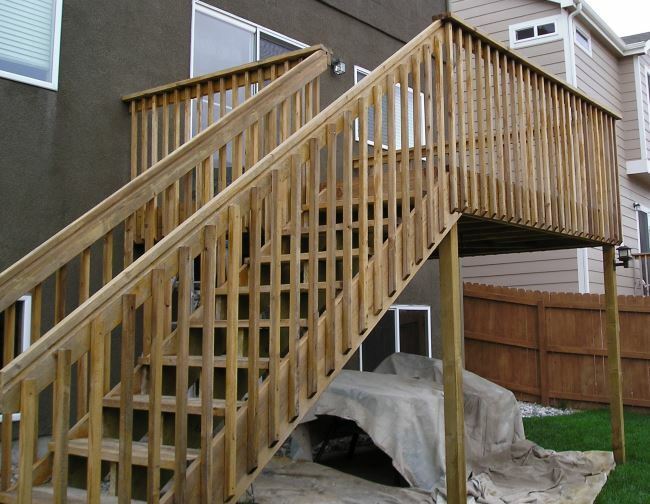 Complete any deck repairs you identified in the first step before moving forward with your refinishing project. Wobbly or too-widely spaced stairs and loose handrails are a recipe for disaster. Protect your family and your guests from injury by attending to these now. Most people don’t realize that moss, algae, mildew and mold is an infestation. These infestations are more than ugly. They damage wood and finishes, and can even present a health hazard. Even worse, sanding or pressure washing will only grind these slimy nuisances deeper into the wood! The best way to deal with these problems (and other persistent stains!) is to use a deck cleaner/brightener. Mix the chemicals according to package directions and scrub them onto the deck using a stiff brush or broom. Let the solution sit for a few minutes, then use a pressure washer to thoroughly rinse the surface. On small areas, a solution of chlorine bleach can be used the same way. After you have killed off the moss, algae, mildew and/or mold, you are ready to sand and pressure wash your deck. The condition of your deck determines whether you should pressure wash first then sand or sand first, then pressure wash. Read more about washing versus sanding your deck. There are many types of deck sealer on the market today, and many promise 2, 3, or 4 year finishes. While most decks will require a maintenance coat of stain every year or two (no matter what the label on the can says! ), it still pays to go with a name brand product. The higher levels of pigment and better moisture resistance of recognized top-of-the-line formulas helps your finish to last longer. You do want to be sure your finish makes it to the next warm, dry season! Read more about choosing deck stain. Make sure you buy enough product to cover the entire deck. For an even finish, especially when stain is involved, you want to mix all the cans of stain together. That way the entire deck will be the same color. Any excess can be stored to use for your yearly deck maintenance. Not sure how much you need? Learn more about calculating coverage. Never apply stain to a wet deck. 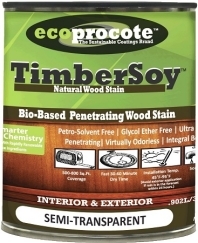 Even though many manufacturers have developed stains that can be applied to damp surfaces, the reality is that even these products cure better and last better when applied to dry wood. Allow the deck to dry thoroughly before walking on it or moving planters and furniture back into place. Remember, deck maintenance begins as soon as the stain is in place! Do you live in Southern Colorado? Crowder Painting does decks!